As you know, Faith Comes By Hearing is a big fan. We promote HearThis and have used it for ½ a dozen projects now. It is a key tool in our suite of recording strategies. Once a HearThis recording is finalized and approved, however you define that, FCBH is open to helping conduct a final mastering of the files with or without music and loading it into itunes as podcasts, bible.is and the Digital Bible Platform (DBP). My life would have been so much easier if HearThis had been around a few years ago! My wife and I have worked on Tanna Island, Vanuatu, since 1991. 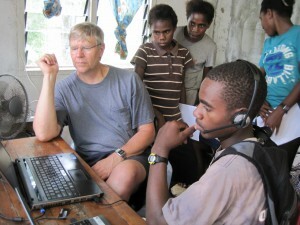 Our first New Testament in the North Tanna language was published in print and audio in 2008. 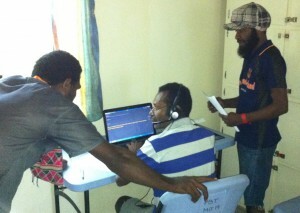 Recording for the North Tanna NT was done using a laptop computer and Audacity. It took me about 4 months to record and another 10 man-months to edit (myself, my wife, and my daughter all worked on editing). We then moved on to a related language on Tanna, Whitesands. The Whitesands NT went to the printer in Mar 2014. We are currently working on recording the audio using HearThis. I am so glad! We worked for about six weeks and recorded about 85% of the New Testament. (Luke was recorded several years earlier with multiple voices reading different characters. About 25% was re-recorded.) About 75% of everything has been revised, i.e., the recording is correct so that the original speaker will not be needed to do re-recordings. Once the remaining revisions are completed (less than one week’s work), all that remains is to have long pauses removed, volumes adjusted, etc. Three books were done with multiple readers who will take the various character parts (Luke, Acts, Revelation). We had 3-4 people recording at one time, and two people checking recorded material. During the first few weeks, we worked for approximately 20 days and recorded about 4000 verses; so that averages about 200 verses/day for first draft. I estimate there may be about four weeks of revision and editing left. So I project that the total time for publishable recording will be about 10 weeks for the NT. So two to three months for a basically edited text. That sure beats 14 months! I have trained about a dozen people to use HT. Training time for basic use was about 5-10 minutes per person. When further help was needed, like changing font size or navigating the books and chapters, we gave instruction as needed. We had three or four people recording at the same time in different rooms. My wife and I were able to check recorded material on our own computers while our readers went ahead recording on their own on other computers. I answered questions and kept the machines going when there were issues which the readers couldn’t solve. But the program was so easy to use that after a few days, the readers solved most of the problems on their own. Two of our readers, the main translator and his brother, were already quite fluent in reading their own language. For the others, it was relatively new. As can be expected, the higher the education level of the reader, the more fluent the reader, regardless of exposure to his own language and orthography. However, even the less educated readers got fairly good fairly quickly. The Listen function was an excellent tool to give feedback and improve reading skills. After a day or two recording, almost everyone was doing quite well. If you haven’t picked it up yet from the description so far, this program is EASY to use. After a few minutes of basic training, readers are off and running. We are also using HT to do a multi-speaker recording (i.e. dramatized). We make the text break before quotation marks, and this gives us an easy way to record the different voices. This required me to find the HT line numbers for the different voices in each dramatized book (I relied on the parts laid out in the VMS scripts files), and to assign those parts to different readers. But once they know where their parts are, they simply navigate to them and do the recording. Since each line of text has its own .wav file designated, different speakers can record on different computers and the resulting .wav files can then be merged easily into a master file. One of the really great features of HT is that after a recording is completed, if a reader has made a mistake, or if a sentence needs to be re-recorded because a chicken crows at an inopportune moment, you simply navigate to that sentence again, re-record until it is correct, and you are done. No need to search through thousands of .wav files and unintelligible wave forms on the screen to find the verse or section you need. Our most successful mic has been a noise canceling USB headset mic. We have also used headset mics with 3.5mm plugs which go through the computer sound card. There really seems to be no need in a relatively quiet place for a sound studio setup – at least not for the sophistication level of our audiences. We have already made plans to do Scripture back-translation using HT. The reader will see the vernacular text come on the screen, do a mental translation into an appropriate language, like the language of wider communication or English, and record it. Then he will listen to his own translation and revise it if needed, and move on to the next verse. The audio back-translation can then be typed into the computer by someone else if that is needed. We have green-lighted on using HT as a literacy tool for younger children. The text comes on the screen, the child can either listen to a teacher reading the text, or simply read the text himself, record his reading, listen to his recording immediately, then re-record until he is satisfied. A teacher can later listen to his reading and help the child make corrections as needed. Very little if any supervision would be needed by the teacher. recording is a snap. The whole recording process is much, much shorter. The final result is excellent. In the Mborena Kam Bible Translation Program, we have really enjoyed working with HearThis, but we are not using it the way you envisioned! We have a completed New Testament almost ready for publishing but we found out that there are some minor grammar and pronunciation issues. A team recorded Mark using HearThis and took it out to the village for checking. Comprehension was close to 100% but the people just weren’t quite happy with it, they called it “a straight road, but full of potholes.” We gathered a group of non-reader “bigmen” who listened to the recording and offered edits. Afterward the team decided this was the perfect way to edit the entire NT to make it perfect. So here I am recording Matthew with a team while a team upstairs goes through what we are recording. They listen to each verse, then decide if it needs changes. If it does, they decide on how to say it, then just press the button and re-record the verse. Later, we will transcribe these changes for the printed NT. None of these men have any computer experience or training, but after a couple of days they were flying. I’m attaching a couple of pictures and a short video showing a young guy using the local language to train an older man. The young guy thought I was doing a bad job and pushed me out of the way to handle the training. This is a great program that we’ll be using a lot in the future to create the recordings which will then be made into Android apps for which the people can distribute from phone to phone over bluetooth. Thanks for your work on it.